In a small saucepan, combine the sugar and water and cook over medium heat just until the sugar dissolves, stirring occasionally. 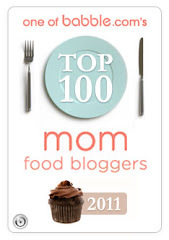 (Alternatively this can be done in a microwave-safe bowl in the microwave). Remove from the heat and transfer to a medium bowl. Set in the refrigerator to cool completely. (Adding the zest and mint while the sugar mixture is still hot will cause discoloration). Once the sugar mixture is completely cool, add the lime zest, juice, mint, and salt. Stir until combined. 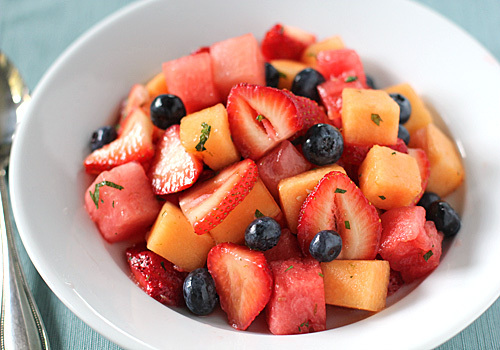 In a large bowl, combine the strawberries, cantaloupe, watermelon, and blueberries. Pour the lime-mint syrup over the fruit and gently toss until combined. Enjoy! The syrup sounds really good. It must add a very special flavor to the already delicious fruit. What a lovely summer recipe. I usually macerate my fruit in raw sugar for a few minutes before serving. But this sounds like a really nice alternative. Wow. the summer fruit salad is a great summer delights that's healthy and heart friendly. We'll surely indulge with it. This looks awesome! I bet drizzling a homemade blueberry liqueur over this would be nice. I just made a batch of blueberry liqueur for my blog and it's simple to make. Could this be made with agave nectar instead for lower glycemic impact? I can't say for certain. I would just add it to taste instead of making a simple syrup solution with it.